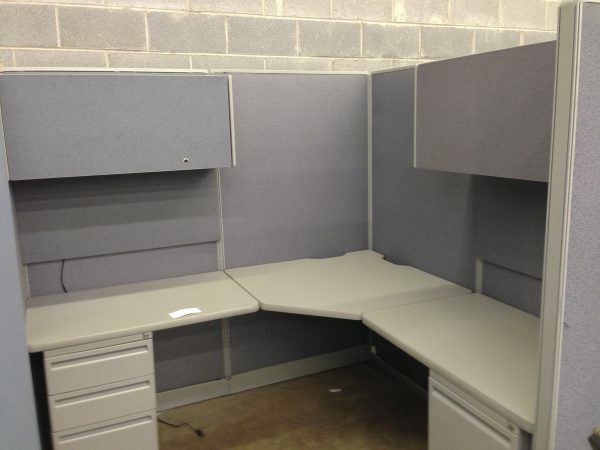 Haworth Unigroup 6×6 cubicles, all panels are 36×64 with power down the spine. Gray laminate and paint with blue/gray panel fabric. Locking BBF and FF pedestals and (1) 36″ shelf and (1) 36″ overhead binder bins with task lights. (2) 36″ tack boards also included. 24×36 corner with 24×36 return worksurfaces. Good as-is condition, sold in 4-packs.